Yesterday, the American Medical Association (AMA) and five other major groups representing doctors, hospitals, insurance companies, pharmaceutical companies and union members delivered a letter to President Obama pledging to cut the U.S. growth rate for healthcare spending by 1.5 percent each year from 2010 through 2019 . 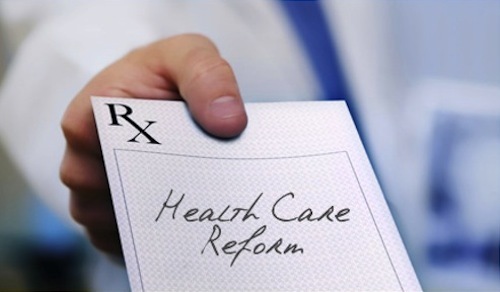 The coalition’s efforts are intended to supplement upcoming legislation aimed at decreasing healthcare costs for families, businesses and the government. Administrative standardization, simplification and transparency. Aligning quality and efficiency incentives among providers to reduce over- and under-use of healthcare. Encouraging coordinated care and adherence to evidence-based best practices and therapies. Reducing the cost of doing business by developing technology and regulatory reform. Although the proposed health expenditure savings is small, experts say it’s significant . The very fact that health industry leaders have stepped forward to voluntarily restrain costs is itself encouraging; these are the same groups that opposed the healthcare reforms proposed by President Clinton in the 1990s. I.O.U.S.A. is a documentary directed by Patrick Creadon that examines the rapidly growing U.S. national debt and its consequences for the United States and its citizens. The film premiered at the 2008 Sundance Film Festival; last summer, it was screened at both the Democratic and Republican National Conventions last summer, earning significant acclaim from critics and audiences alike . This weekend, I.O.U.S.A. is making its television debut on CNN. You can catch it this afternoon, Sunday, January 10th at 3 p.m. EST. The broadcast will be hosted by Ali Velshi and Christine Romans, co-anchors of CNN’s weekend business roundtable program Your $$$$$. I wrote about Healthcare Costs and the Looming U.S. Budget Crisis last summer here on Highlight HEALTH. I.O.U.S.A. follows now former Comptroller General David Walker and Robert Bixby, Executive Director of the Concord Coalition, on their cross-country Fiscal Wake-Up Tour to talk to the American people about the country’s debt problem. The movie further underscores the need for immediate reform of Americas major entitlement programs, Social Security, Medicare and Medicaid. Wake up, America! We’re on the brink of a financial meltdown. I.O.U.S.A. boldly examines the rapidly growing national debt and its consequences for the United States and its citizens. Burdened with an ever-expanding government and military, increased international competition, overextended entitlement programs, and debts to foreign countries that are becoming impossible to honor, America must mend its spendthrift ways or face an economic disaster of epic proportions. Throughout history, the American government has found it nearly impossible to spend only what has been raised through taxes. Wielding candid interviews with both average American taxpayers and government officials, Sundance veteran Patrick Creadon (Wordplay) helps demystify the nation’s financial practices and policies. 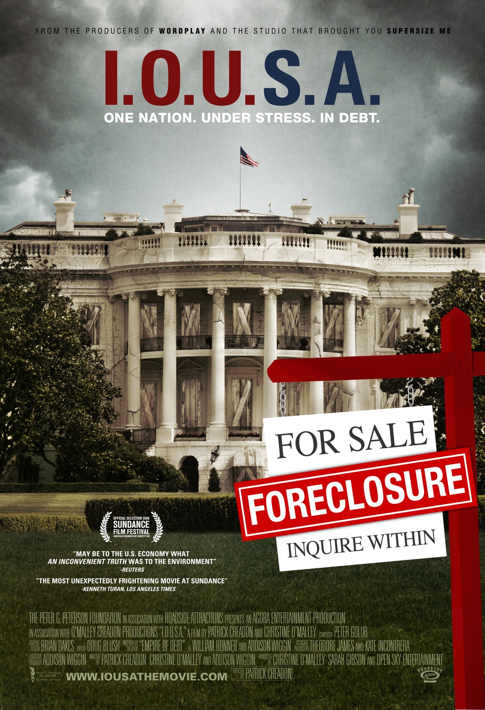 The film follows former U.S. Comptroller General David Walker as he crisscrosses the country explaining America’s unsustainable fiscal policies to its citizens. With surgical precision, Creadon interweaves archival footage and economic data to paint a vivid and alarming profile of America’s current economic situation. The ultimate power of I.O.U.S.A. is that the film moves beyond doomsday rhetoric to proffer potential financial scenarios and propose solutions about how we can recreate a fiscally sound nation for future generations. Creadon uses candid interviews and his featured subjects include Warren Buffett, Alan Greenspan, Paul O’Neill, Robert Rubin, and Paul Volcker, along with the Peter G. Peterson Foundation’s own David Walker and Bob Bixby of the Concord Coalition, a Foundation grantee. Pointedly topical and consummately nonpartisan, I.O.U.S.A. drives home the message that the only time for America’s financial future is now. 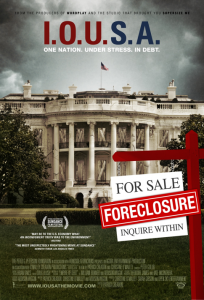 If you’re concerned about America’s impending financial disaster, you owe it to yourself (and your children) to see this movie. ‘I.O.U.S.A.’ Makes TV Debut on CNN. Documentary.org 2009 Jan.
About the Movie. I.O.U.S.A. the Movie. Accessed 2009 Jan 11th.